Pottery as an activity in school provides a creative outlet for children of all classes. Most children show keen interest in pottery sessions held in school. 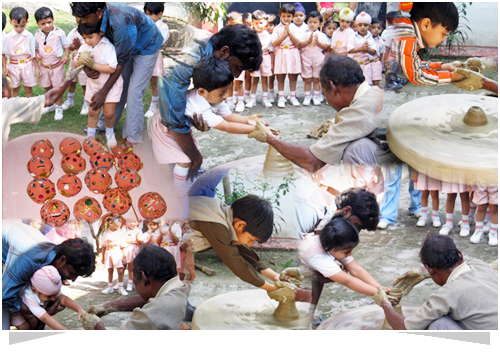 All children Have imparted knowledge and taught techniques in using the pottery wheel. The steps in Pottery-making include, moulding on the pottery wheel, then allowing drying time for up to a week and then is the colourful glazing. With several pottery sessions in school, children have enjoyed learning about the skill of pottery making and have made some magnificent pieces! Over the years, children have we made many items with clay, including diyas, pen-stands, pots, plates, bowls and cups.